This is Manchester-based, Manchester-proud Monkeywood Theatre's theatrical ode to their city. Performed as part of HOME's PUSH Festival, there are 19 sketches each taking a different Manchester town as its starting point, and one of these plays will be performed before every performance in Theatre 2 during the PUSH Festival, and all 19 performed back-to-back for one more time only on the 27th January. All 19 sketches took just shy of one hour to perform, and so they are all on average 3 minutes long, and utilise 6 actors / actresses with a good mix between monologue, duologue and even a couple where more or all are used. However, my over-riding concern with these shorts is simply that they do little or nothing to glorify Manchester or the people who live here. If the company's intention is to tell visitors and non-Mancunians that Manchester is populated with scallies, druggies, idiots, illiterates etc, and that all districts are just as bad as each other, despite those who live there feeling affection for them, then they have succeeded, since that was the overall and lasting image / message that I took from this presentation. I don't think that that was their intent though. All 19 shorts were written by different writers, one assumes although it is never said, by a writer who lives in the town in question. We started with a rap about Little Hulton, went through different writing styles including performance poetry about Burnage, and ended with a paean to the rough and ready, slightly wrong side of the law side of the city centre. 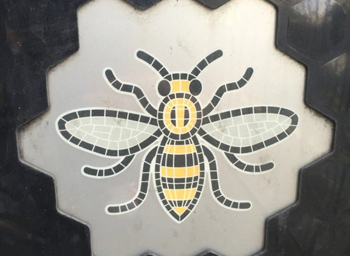 At the start of this presentation we looked out on an open stage with 19 honeycomb-shaped boxes, and mats, with the names of the towns written on with the Manchester symbol of the bee prominent on a couple, and all were interconnected with coloured lines on the floor like the London Underground map. A nice idea, and this worked well as the six performers started each piece from wherever the town's name was, and a screen above the actors showed a photo of the town and writer. This simple idea worked surprisingly well, and the order was excellently chosen as the pieces seemed to naturally flow from one to the next. Some lovely information was to be learned too in a couple of the pieces, such as finding out that Cornbrook used to be a desirable and leafy suburb with an exotic animal house. However, information of this nature was very thin on the ground, and most of the plays did frankly nothing to make their chosen town even remotely interesting. The worst offender in this regard being Chris Hoyle's, Middleton. The six performers (5 of whom also wrote one of the pieces) were well chosen, and their impassioned monologues and dialogues did show us that despite the subject matter being less than pleasant, they still did love Manchester, for all its faults. The actors were Curtis Cole, Rueben Johnson, Sarah McDonald Hughes, James Quinn, Meriel Schofield and Eve Steele. I did find the speaking rather too quiet at times. I was sitting on the back row of the studio space, but that is not too far away, and struggled on several occasions to hear some of the performers. However, I should give a special mention to James Quinn, whose acting today impressed more than that of the others. His audibility was perfect and the changing of his character for each sketch he was in, was far more noticeable than any actor (although his Spaniard seemed more Eastern European to me). The Manchester Project is an interesting and quirky idea that perhaps reads better on paper than works in performance, but worth watching nevertheless.